Even though women face enormous challenges within society, one group that has a peculiar set of problems is widows and single mothers. In some African cultures, widows are deprived of basic rights and are frequently abused. 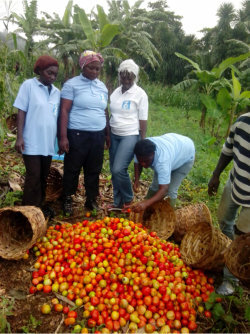 In order to give them a voice and lift them out of the poverty cycle,The Agatha Foundation has set up a cooperative meant to enhance skills and develop capacity. 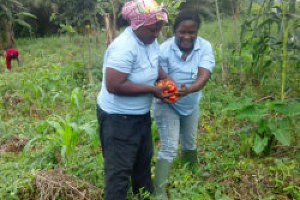 Hence there is a farming wing whereby those women with agricultural competencies, farm and bring their produce to the cooperative and we provide a market. Through a partnership with boarding schools for example, we are able to get a reasonable price for beans, vegetables, corn, plantains to name but these. Some are good in embroidery and so we set up a loan scheme which allows them to get basic materials and then stitch traditional African wear, caps, bags etc. Then we are now opening up a market here in the United States where in partnership with some groups we guarantee the quick sales of these products. There is livelihood as most of these women can sponsor their children in schools, provide food, clothing and shelter and even save. Beyond just doing things for and with women and children, The Agatha Foundation has a primary duty to also be with and stand for women and children. Our partnerships with Human Rights Defense groups, law firms, multilateral institutions and NGOs provide us a platform to advocate for the rights and needs of women and children.